what causes the cathedral/flame pattern on flat sawn lumber? 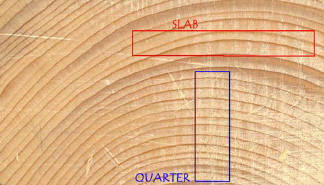 I am wondering if anyone has any insight into why the cathedral/flame pattern results in flat sawn boards. For some reason I am having a hard time visualizing why this occurs. Is this what you mean, otherwise could you clarify whether you mean the wood grain such as so called “feather crotch” or “flame”, as above or you are talking about some kind of milling marks, like from a saw????? If it’s in the grain and you mean feather crotch wood this is due to a fork in the tree. The larger the pattern then the bigger the fork. Big double main trunk trees will have the biggest and most of the time the prettiest. Not sure the exact terminology for it, but basically it’s where the grain is trying to grow both ways or switch directions. You get a different effect sawing it flat to the fork or perpendicular. One thing is for certain, that is if we are talking about the same thing…whatever you call it and whatever the reason it happens….it is rare and it is expensive. The reason is boards are sawn from logs and logs are truncated cones in shape. 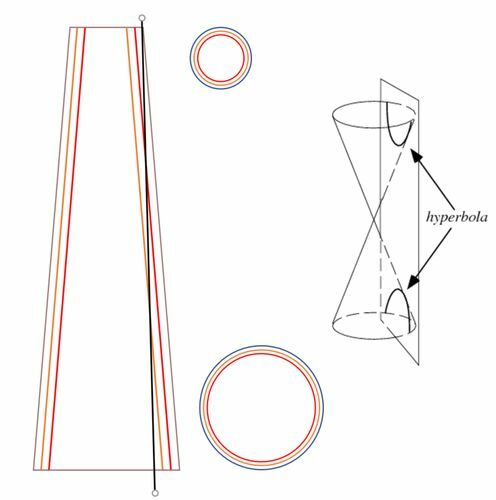 The annual rings are parallel to the sides of the cone. Boards are sawn straight and not parallel to the sides and intersect the annual rings at a slight angle creating a pattern that is parabolic in shape as the face of the board intersects the annual rings. This simple diagram will probably help. 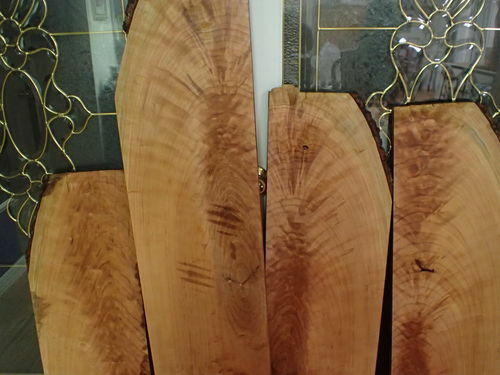 As noted by Loren above, a tree is not uniform and the grain varies, but as a rule the tops of trees are smaller than the bottoms and the growth rings are continuous. So if consider a perfectly circular tree with perfect growth rings, then you can think of the growth rings are sort of cones. When you section a cone vertically, you get the parabolic shape at the top. Thus the cathedral pattern where the saw cut crosses the growth ring at that point. My teachers always said this was going to come in handy one day….. The arching, cathedral, pattern is caused during the cutting procedure as demonstrated above. However the “flame” type patters is most often caused by a juncture of two limbs coming together. When collecting turning blank wood from trees being cut down I always try to preserve these junctions of the limbs or trunks.